See you in a couple of weeks with all the juicy details. It looks like quite a place! Have fun! Have fun in Vegas!Did I guess right? Have a great time! I look forward to hearing all about it when you get back. Morocco for sure! Essaouira, possibly? Angelica nailed it. Have fun in Morocco! Either Morocco, Turkey, or Cyprus. morocco, for sure. i’ve taken almost exactly the same picture of essaouira, last december. 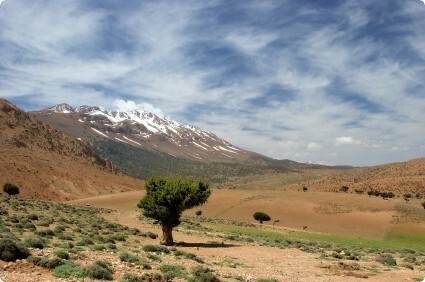 & the atlas mountains! amazing. Jaipur.spices- turmeric,red chilli,could be India as they display spices in similar fashion and jaipur does have castles resembling but its the sea gulls make me believe its morocco ! Morocco, 100% sure. For the arrangement of the spices and the tiles on the wall and the architecture. Have fun. It’s a beautiful country. My guess would be somewhere in the middle-east..Turkey Maybe? Maroc…! Isn’t it a view of Essaouira? 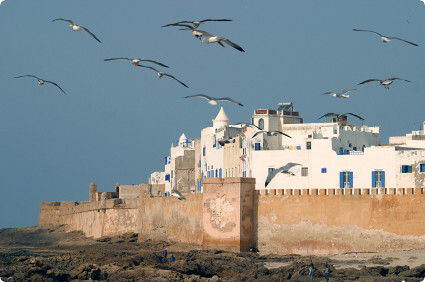 Mmh, Essaouira, top of destinations list. Can’t wait for your recipes of harira, tajine and cornes de gazelle. Yummy! hmm i say morroco too… can’t wait to hear all about the delicious food you’re going to be eating! This isn’t Greece? ?Waiting to hear all about it! Have fun! I do NOT know where that is, but I wish I did! So, so beautiful! Please take lots of pictures so us poor homebound folks can enjoy vicariously.. Have a wonderful time, can’t wait to read the details! That’s definitely Essaouira in Morocco, for sure. Essaouira was the best place I visited in Morocco, people were so friendly and it was the safest I felt. Trouble is, I didn’t spend enough time there as was travelling through the country from Agadir to Casablanca where I got chronic food poisoning. I made a mistake of visiting El Jadida after Marrakech (on the coast) but was too late to go back. I just want so badly to go to Morocco. But if someone else gets to go instead, I’m glad it’s you, as you will provide us with the vicarious Morocco experience. I’m counting on you- despite being consumed with envy. Hi – I just found this site, and I love it. Thanks especially for the panelle recipe below. My disseration is on medieval Sicily, and when I was there last I think I ate panelle on a roll at least once every day! I look forward to future Sicilian or other Mediterranean recipes from you in the future.Have a blast in Morocco – can’t wait to see what food-related adventures you had there! I have never been to Morocco but that is my first guess. Someone suggested Zanzibar but I have been there and it didn’t look like that. Oh yes, like many, I see le Maroc!Have fun, I cannot wait to hear and see all about it. I love this country and colors! marocca sure !! enjoy ! Morocco, Essaouira, the first picture maybe "Tal der Ammeln"…? How beautiful! 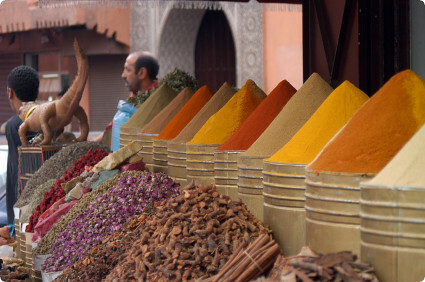 The picture of the spice sellers in your previous post is breathtaking. How do the merchants protect them against the wind and debris?